Wayman Publishing is hosting a Blogfest and Book Fair Giveaway during the week of Labor Day! ALL ENTRANTS will be given the opportunity to have UNLIMITED ACCESS to download ANY of Wayman Publishing’s Top 10 Books during the dates of Sept 2 – Sept 4!! (with full package – $269 Value!) for FREE to one lucky winner!! Can you think of anything more generous?! PLUS, we are also giving away $200 Paypal CASH! Start the year on a POSITIVE note! Start the year off on a positive note! Help motivate your students and honor their achievements with certificates, diplomas and awardsthroughout the school year. Awarding a certificate of achievement is one of the best ways to help students stay motivated and to show them that their efforts have not gone unnoticed. 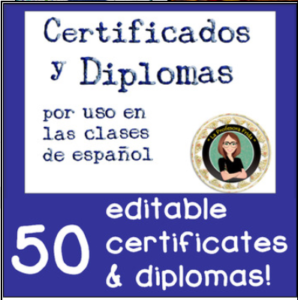 ”50 Certificados & Diplomas for your Spanish Students – Motivation!” is a brand new packet created by LaProfesoraFrida and available at TeachersPayTeachers. Check it out and let this be a way that you help inspire your studentsthroughout the school year! http://thestressfreespanishteacher.com/wp-content/uploads/2018/08/Eyes-and-Glasses-300x149.png 0 0 admin http://thestressfreespanishteacher.com/wp-content/uploads/2018/08/Eyes-and-Glasses-300x149.png admin2012-08-04 18:46:002017-08-29 12:08:57Start the year on a POSITIVE note!